Automotive Safety Engineering's (ASE) patented Energy Absorbing Bollards (EAB) are designed, developed and manufactured in Australia, and are the benchmark bollard used throughout the world including Australia, Japan, USA and the Middle East. 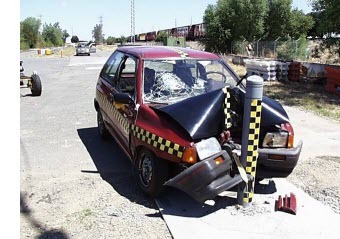 ASE's Energy Absorbing Bollards not only provide protection to people and buildings from out-of-control vehicles, they also partially absorb the vehicle impact, reducing the risk of serious injury to the vehicle's driver and occupants. ASE's Energy Absorbing Bollards can be designed to suit your specific requirements. 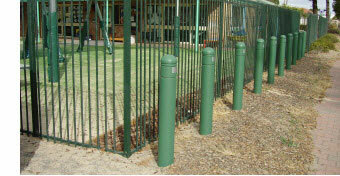 Polyethylene covers can be provided in any shape or colour to provide style, elegance, and maintenance-free bollards. These covers can be tailored to blend with or enhance the appearance of the adjacent area, ensuring the installation of our bollards improves safety without compromising the aesthetics of their surroundings. ASE's Energy Absorbing Bollards have undergone extensive testing to ensure they not only perform the functions for which they were designed, but also meet all legislated Standards and associated Design Rules. For further information about ASE's Energy Absorbing Bollards, or to discuss the suitability of our bollards for your intended use, please contact ASE.